Environmental Health Science Laboratory, Sumitomo Chemical Co., Ltd. In all current in vitro skin sensitisation assays, DMSO is used to dissolve water-insoluble chemicals. However, our previous study suggested the superiority of the modified IL-8 Luc assay (mIL-8 Luc), in which X-VIVOTM 15 is used to dissolve chemicals, over the original assay using DMSO (oIL-8 Luc). In this study, to confirm the superiority of the mIL-8 Luc, we first increased the number of chemicals examined and demonstrated the superiority of the mIL-8 Luc, in which the mIL-8 Luc provided 87.6% of sensitivity, 74.2% of specificity, and 84.6% of accuracy. Next, to clarify the cause of false negative judgment by the mIL-8 Luc, we examined the effects of physical properties of chemicals on judgment. The results demonstrated that high molecular weight, high LogKo/w, or poor water solubility, did not cause false negative judgment. When it was accepted as an OECD test guideline, the criteria of the mIL-8 Luc to determine sensitisers were modified to further decrease false negative judgment by poor solubility. By applying the new criteria, the test guideline IL-8 Luc assay (tgIL-8 Luc) improved sensitivity but decreased specificity and increased the number of chemicals that cannot be judged. To overcome this problem, we examined a simple combination of the tgIL-8 Luc with direct peptide reactive assay (DPRA), which could improve specificity and decrease the number of the chemicals that cannot be judged. These data suggest that the tgIL-8 Luc is a promising in vitro skin sensitisation assay in combination with other in vitro or in chemico methods. In 2012, the Organisation for Economic Co-operation and Development (OECD) published the adverse outcome pathway (AOP) for skin sensitisation (OECD, 2012), which defined the key events in the sensitisation process. In brief, the chemical sensitizer penetrates the stratum corneum, the uppermost layer of the skin, and subsequently binds covalently to proteins (key event 1) to form hapten-protein conjugates, which can be immunogenic. In parallel, keratinocytes are stimulated to both release danger signals (e.g., pro-inflammatory cytokines or ATP) and activate anti-oxidative response genes (key event 2). Dendritic cells (DCs) then develop a mature phenotype involving the induction of various co-stimulatory molecules and production of pro-inflammatory cytokines and chemokines with formation of hapten-protein conjugates on major histocompatibility complex molecules (key event 3). The activated DCs are mobilized and then migrate from the skin to the draining lymph nodes to present the allergen to T cells. After stimulation by DCs, hapten-peptide–specific T cells expand (key event 4) to elicit an adverse immune response in case of a second exposure to the chemical sensitizer. The establishment of the sensitisation AOP prompted the development of a variety of non-animal test methods for distinguishing sensitizers from non-sensitizers and classifying potency (reviewed previously in (Adler et al., 2011) and (Reisinger et al., 2015)). Recently, the OECD released new test guidelines (TGs) for skin sensitisation testing using the direct peptide reactivity assay (DPRA) (OECD TG 442C) (OECD, 2015b), the KeratinoSens (OECD TG 442D) (OECD, 2015a), the human Cell Line Activation Test (h-CLAT), the U937 cell line activation Test (U-SENSTM), and the Interleukin-8 Reporter Gene Assay (test guideline; tgIL-8 Luc) methods (OECD TG442E) (OECD, 2018). These TGs target three different key events in the AOP. For example, the DPRA examines protein-binding/haptenization of chemicals, KeratinoSens examines the induction of the Kelch-like ECH-associated protein 1 (Keap-1)/nuclear factor (erythroid-derived 2)-like factor 2 (Nrf2) pathways in keratinocytes, and the h-CLAT, the U-SENSTM, and the tgIL-8 Luc evaluate the production of CD54 and CD86 or the induction of IL-8 promoter induced by DC activation. The IL-8 Luc assay we established uses a stable THP-1–derived IL-8 reporter cell line, THP-G8. These cells harbor the stable luciferase orange (SLO) and stable luciferase red (SLR) genes under control of the IL-8 and glyceraldehyde-3-phosphate dehydrogenase (GAPDH) promoters, respectively (Takahashi et al., 2011). In the process of optimizing this assay, we determined the protocol, the criteria for judging chemicals, and the exclusion criteria for detergents and anhydrites. In addition, in the original IL-8 Luc assay protocol (oIL-8 Luc), poorly water-soluble chemicals were first dissolved in DMSO and then diluted with culture medium. On the other hand, in the modified IL-8 Luc assay (mIL-8 Luc), chemicals are dissolved in X-VIVOTM 15 serum-free culture medium, regardless of water solubility, and then diluted with X-VIVOTM 15 (Kimura et al., 2015). After these optimizations, the mIL-8 Luc exhibited 86% accuracy, 84% sensitivity, and 90% specificity in examinations of 118 chemicals (Kimura et al., 2015). In this study, we first presented a data set of mIL-8 Luc for 143 chemicals and confirmed the better performance of the mIL-8 Luc by increasing the number of chemicals examined than the oIL-8 Luc using DMSO as a solvent. We also demonstrated that false negative results in the mIL-8 Luc were not caused by high LogKo/w or poor water solubility. In addition, since the final criteria of the IL-8 Luc assay accepted in OECD test guideline (tgIL-8 Luc) were modified from the original criteria we have published previously (Kimura et al., 2015), we also presented a data set of the tgIL-8 Luc for 143 chemicals and its performance based on the criteria accepted by OECD. Moreover, to improve its performance, we devised an integrated approach with DPRA. Finally, we calculated the minimum concentration of chemicals required to satisfy the criteria, i.e., Ind-IL8LA ≥ 1.4, (Effective Concentration 1.4: EC1.4). Based on the resulting EC1.4 data of chemicals, we examined the correlations between the tgIL-8 Luc EC1.4 and the percent depletion of peptides in the DPRA (Gerberick et al., 2004), CD86 EC150 and CD54 EC200 in the h-CLAT (Takenouchi et al., 2015), or EC 1.5 in the KeratinoSens assay (Natsch et al., 2013). We established the THP-G8 reporter cell line, which was derived from THP-1 human acute monocytic leukemia cells expressing the genes for SLO regulated by the IL-8 promoter and SLR regulated by the GAPDH promoter (Takahashi et al., 2011; Kimura et al., 2015). THP-G8 cells were maintained in RPMI-1640 medium (Gibco, Carlsbad, CA, USA) containing 10% fetal bovine serum (Biological Industries, Kibbutz Beit Haemek, Israel), antibiotic and antimycotic agents (Gibco), 0.15 μg/mL puromycin (InvivoGen, San Diego, CA, USA), and 300 μg/mL G418 (Nacalai Tesque, Kyoto, Japan). Cells were cultured at 37°C with 5% CO2. For testing, THP-G8 cells were plated into a 96-well flat-bottom black plate (Greiner Bio-one, Frickenhausen, Germany) at 5 × 104 cells/50 μL/well. We previously published data regarding the performance of the oIL-8 Luc after examining 122 chemicals and the mIL-8 Luc after examining 118 chemicals (Kimura et al., 2015). In the present study, we examined 21 additional chemicals using the mIL-8 Luc (Supplementary Table 1) and made a data set of the mIL-8 Luc for 143 chemicals (Supplementary Table 2). These 21 chemicals included 3 extreme sensitizers, 1 strong sensitizer, 6 moderate sensitizers, 9 weak sensitizers, and 2 non-sensitizers. All 21 chemicals had been previously evaluated and classified using the local lymph node assay (LLNA (Gerberick et al., 2005). All chemicals were purchased from Sigma-Aldrich (St. Louis, MO, USA) at the highest available purity. The precise procedure of the mIL-8 Luc was described in our previous publication (Kimura et al., 2018) and the OECD test guideline (OECD, 2018). Briefly, to dissolve chemicals, X-VIVOTM 15, a commercially available serum-free medium (Lonza, 04-418Q), was added to 20 mg of test chemical (regardless of the chemical’s solubility) in a microcentrifuge tube, brought to a volume of 1 mL, vortexed vigorously and then shaken on a rotor at a maximum speed of 8 rpm for 30 min. For test chemicals soluble in X-VIVOTM 15, the solution was diluted by a factor of 5 with X-VIVOTM 15 and used as an X-VIVOTM 15 stock solution of the test chemical. For test chemicals not soluble in X-VIVOTM 15, the mixture was rotated again for at least 30 min, and then centrifuged at 15,000 rpm (≈20,000g) for 5 min; the resulting supernatant was used as an X-VIVOTM 15 stock solution of the test chemical. In the first test run, a total of 10 serial dilutions of the X-VIVOTM 15 stock solutions of the test chemicals was made at a dilution factor of two. In subsequent test runs (i.e. the second, third, and fourth replicates), the X-VIVOTM 15 stock solution was made at the concentration 4 times higher than the concentration of cell viability 05 (CV05; the lowest concentration at which the Inh-GAPLA becomes < 0.05) in the first experiment. A total of 10 serial dilutions of the X-VIVOTM 15 second stock solutions were made at a dilution factor of 1.5. Next, 50 μL/well of diluted solution is added to 50 μL of the cell suspension in the wells of a 96-well flat-bottom black plate. The samples were then mixed on a plate shaker and incubated for 16 hr at 37°C and 5% CO2, after which the luciferase activity was measured as described below. Each concentration of each test chemical was tested in 4 wells. The mIL-8 Luc requires at most 4 test runs to determine whether a chemical has a positive or a negative prediction. These procedures are schematized in Supplementary Fig. 1. The activity of SLO and SLR of THP-G8 cells can be measured simultaneously and quantitatively using optical filters (Nakajima et al., 2005; Noguchi et al., 2008). In this study, luciferase activity was determined using a microplate-type luminometer with a Phelios multi-color detection system (Atto Co., Tokyo, Japan) and the Tripluc® luciferase assay reagent (Toyobo Co., Ltd., Osaka, Japan), according to the manufacturer’s instructions. Since some chemicals affected cell viability, we defined the parameter nIL8LA to represent IL-8 promoter activity. This parameter is calculated by normalizing the IL-8 luciferase activity (IL8LA) to GAPDH luciferase activity (GAPLA). We also calculated the Inh-GAPLA by dividing the GAPLA of chemically treated THP-G8 cells by that of non-treated cells. The Ind-IL8LA was calculated by dividing the nIL8LA of chemically treated THP-G8 cells by that of non-stimulated cells. The parameters used in the mIL-8 Luc are defined in Table 1. Table 1. Description of terms associated with the luciferase activity in the mIL-8 Luc. CV05 The lowest concentration of the chemical at which Inh-GAPLA becomes < 0.05. When the mIL-8 Luc was accepted as an OECD test guideline, however, the criteria were modified. Namely, after determining positive or negative in each experiment, as described in the original criterion, chemicals that provide two positive results in the first, second, third, or fourth experimental replicates are considered as sensitizers, and chemicals that provide three negative results in the first, second, third, or fourth experimental replicates are considered as supposed negative. Then chemicals judged as supposed negative are further classified into negative when chemicals are dissolved at 20 mg/mL and “should not be considered” when they are not dissolved. In addition, any detergents or any anhydrites are included in the exclusion criterion (OECD, 2018). Based on the new criteria, the mIL-8 Luc was designated as the tgIL-8 Luc in this manuscript. In the procedure for the mIL-8 Luc, we first determined whether 20 mg of the test chemical would dissolve in 1 mL of X-VIVOTM 15. If the chemical was soluble, the concentration of the stock solution was 20 mg/mL. If the chemical was not soluble in X-VIVOTM 15, the concentration of the stock solution was not determined. Therefore, to estimate the concentration of the stock solution when 20 mg of the chemical was not dissolved in 1 mL of X-VIVOTM 15, we examined the solubility of the chemical at 2 mg/mL in X-VIVOTM 15. Namely, X-VIVOTM 15 was added to 2 mg of the chemical up to 1 mL in a 1.5-mL microcentrifuge tube (Eppendrof, Hamburg, Germany). If the chemical was dissolved after vigorous vortex and rotation at a maximum speed of 8 rpm for 30 min, the concentration of the stock solution was estimated as 2 mg/mL, and if it did not dissolve, the concentration was approximated by 0.2 mg/mL. In particular, for liquid chemicals, 1 mg of Sudan black B (Merck, Dalmstadt, Germany) was added to 1 mL of the chemical substance (0.1% [w/v]) to permit visualization of insoluble chemical. 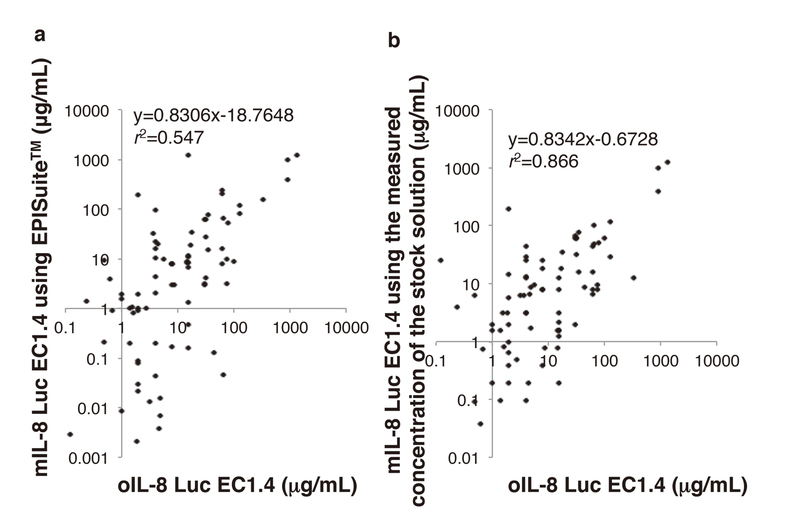 To examine the correlation among the results of the mIL-8 Luc, oIL-8 Luc, DPRA, h-CLAT, and KeratinoSens assays, we first determined the minimum induction threshold in the IL-8 Luc and oIL-8 Luc that are defined as the lowest concentration at which chemicals satisfy the positive criteria of the assays. Then we examined the correlation curves and r2 values for comparisons of the IL-8 Luc EC1.4, oIL-8 Luc EC1.4, percent depletion of peptides in DPRA, h-CLAT CD86 EC150, h-CLAT CD54 EC200, and KeratinoSens EC 1.5 using BellCurve for Excel (SSRI Co., Ltd., Tokyo, Japan). In this study, to complete the data set of the mIL-8 Luc, we examined 21 more chemicals using the mIL-8 Luc and oIL-8 Luc in addition to the 122 chemicals analyzed previously (Kimura et al., 2015). The chemicals examined included 3 extreme sensitizers, 1 strong sensitizer, 6 moderate sensitizers, 9 weak sensitizers, and 2 non-sensitizers (Supplementary Table 1). The performance of the mIL-8 Luc was 86.0% of sensitivity, 63.9% of specificity and 80.4% of accuracy, while that of the oIL-8 Luc was 76.6% of sensitivity, 69.4% of specificity, and 74.8% of accuracy. After applying the exclusion criterion for detergents and anhydrides, the mIL-8 Luc provided 87.6% of sensitivity, 74.2% of specificity, and 84.6% of accuracy, while the oIL-8 Luc provided 78.1% of sensitivity, 77.4% of specificity, and 77.9% of accuracy. On the other hand, when the criteria in the OECD test guideline 442E were applied, it provided 95.8% of sensitivity, 40.9% of specificity, and 85.8% of accuracy. After applying the exclusion criterion, it provided 95.8% of sensitivity, 53.0% of specificity, and 89.4% of accuracy. In these criteria, 23 chemicals among 143 examined chemicals were judged as “should not be considered” (Table 2). Table 2. The performance of the IL-8 Luc assay using different solvents and criteria. Since the mIL-8 Luc does not use DMSO as a solvent, it may be unable to correctly evaluate sensitisers with large molecular weights, high LogKo/w, or poor water solubility. We next compared 3 physical properties between sensitisers judged as positive (true positive) and those judged negative (false negative) by the mIL-8 Luc: molecular weight, LogKo/w, and water solubility (Fig. 1a, 1b, and 1c). 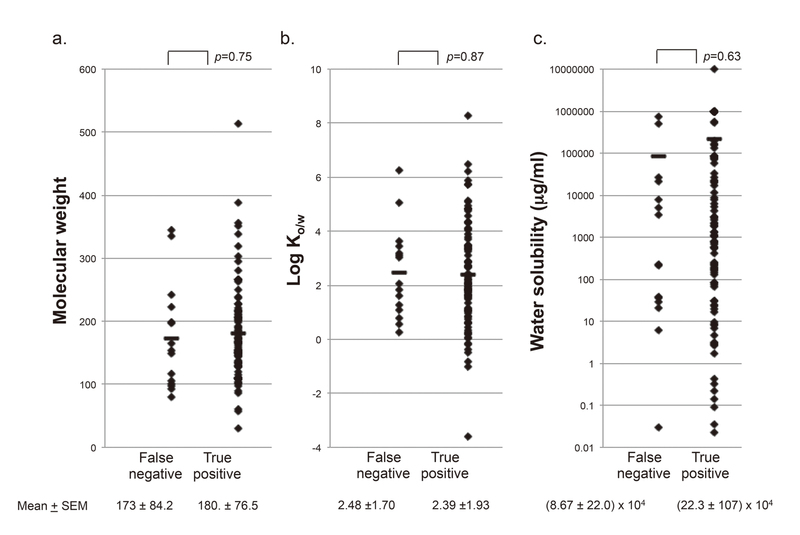 The results clearly indicated that the means +/- SEM of molecular weight, LogKo/w, and water solubility are very similar between chemicals judged as true positive and those judged as false negative. In other words, high molecular weight, high LogKo/w, or poor water solubility does not cause false negative judgment. Physical properties of sensitisers correctly or incorrectly judged by the mIL-8 Luc. Sensitizers judged by the LLNA are divided into chemicals correctly (true positive) or incorrectly (false negative) judged by the mIL-8 Luc. Molecular weight (a), LogKo/w (b), and water solubility (c) of each chemical are plotted on the y-axis for each group. The mean and p value compared with Student’s t-test are shown. There is a wide consensus that due to the complexity of the skin sensitisation pathway, no single non-animal method can replace animal testing, and instead it will be necessary to develop integrated approaches to testing and assessment (IATA) using combinations of assays representing different KEs of the AOP (reviewed by Roberts et al. (Roberts and Patlewicz, 2018)). In addition, since the tgIL-8 Luc, which is based on the criteria accepted by the OECD, showed poor specificity in spite of its high sensitivity and reasonable accuracy, we developed a simple test battery with DPRA. Most in vitro test methods so far accepted as OECD test guidelines have some trouble with false positive data caused by the poor solubility of chemicals in the culture medium. So, we combined the tgIL-8 Luc with in chemico method, DPRA. In this approach, chemicals are first examined by the tgIL-8 Luc because it is characterized by high sensitivity. Then the chemicals that are excluded by the applicability domain or by the judgment as “should not be considered” are evaluated by DPRA. The performance of this battery approach resulted in a significant improvement of specificity and became 93.5% of sensitivity, 68.6% of specificity and 87.3% of accuracy (Table 2). In the mIL-8 Luc, when the chemicals do not dissolve in X-VIVOTM 15, they are vigorously vortexed, sonicated if necessary, and centrifuged and the resulting supernatant is then used as the stock solution. Therefore, when chemicals do not dissolve at 20 mg/mL, the concentration of the stock solution must be determined by some procedures. In our previous study (Kimura et al., 2015), because our procedure involved attempting to dissolve chemicals to their water solubility by a variety of methods, the water solubility given by EPI SuiteTM was substituted as the concentration of the stock solution. To calculate the concentration of the stock solution more accurately, in the present study, we estimated the concentration of the stock solution by directly examining the solubility of chemicals at 20 mg/mL and 2 mg/mL as described in the Materials and Methods. The estimated concentration of the stock solutions is presented for each chemical in Supplementary Table 2. After calculating the concentrations of the stock solutions, we determined the EC1.4 of sensitizers by dividing the calculated concentration of the stock solution by the dilution factor required to obtain the lowest concentration at which the chemical would satisfy the positive criterion. The EC1.4 of 143 chemicals analyzed using the mIL-8 Luc or the oIL-8 Luc are shown in Supplementary Table 2. We then assessed the correlation between the EC1.4 determined using the mIL-8 Luc and those determined using the oIL-8 Luc. A strong correlation was observed when we calculated the mIL-8 Luc EC1.4 using EPI SuiteTM water solubility data (Fig. 2a, R2 = 0.547). The correlation was much stronger when we calculated the mIL-8 Luc EC1.4 using the concentration of the stock solution (Fig. 2b, R2 = 0.866), thus validating the calculations of the prepared stock solutions. Correlation between the EC1.4 of the mIL-8 Luc and oIL-8 Luc. The mIL-8 Luc EC1.4 were plotted against the oIL-8 Luc EC1.4 for sensitisers. (a) Water solubility of chemicals as indicated by EPI SuiteTM software was used to calculate the concentration of the stock solution. (b) The concentration of the stock solution was calculated by the devised procedure. We next assessed the correlation between the mIL-8 Luc EC1.4 data and the parameters of other in vitro or in chemico test methods, such as the DPRA, h-CLAT, and KeratinoSens assays. Initial analyses of the correlation between mIL-8 Luc EC1.4 and the percent depletion of peptides containing glutathione or the amino acids cysteine, lysine, or histidine in the DPRA (Gerberick et al., 2004) showed no statistically significant correlation (Fig. 3). Similarly, we examined the correlation between mIL-8 Luc EC1.4 and the concentration required to induce ≥ 150% augmentation of CD86 in the h-CLAT assay (CD86 EC150) (Fig. 4a) and the concentration required to induce ≥ 200% augmentation of CD54 in the h-CLAT assay (CD54 EC200) (Fig. 4b) (Takenouchi et al., 2015). Weak correlations were found between the mIL-8 Luc EC1.4 and CD86 EC150 (R2 = 0.231) and CD54 EC200 (R2 = 0.136). No significant correlation was observed between the mIL-8 Luc EC1.4 and EC 1.5 in the KeratinoSens assay (Natsch et al., 2013) (Fig. 4c, R2 = 0.002). These results suggest that the data obtained using the mIL-8 Luc cannot be obtained using other test methods, and that combining the mIL-8 Luc with other test methods could enable more accurate predictions than any single test method. Correlation between the mIL-8 Luc and other screening methods (DPRA). The correlation between mIL-8 Luc EC1.4 and the percent depletion of peptides containing glutathione, cysteine, lysine, or histidine in the DPRA was examined for various sensitizers. Correlation between the mIL-8 Luc and other screening methods (hCLAT and Keratinosens). 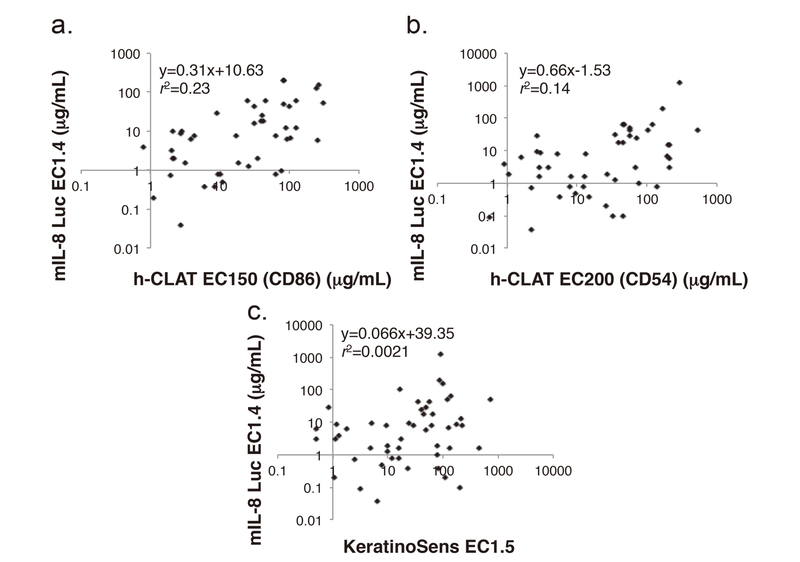 The correlation between mIL-8 Luc EC1.4 and (a) CD86 EC150 and (b) CD54 EC200 for the h-CLAT assay and (c) EC 1.5 for the KeratinoSens assay was examined for various sensitizers. DMSO is an organosulfur compound and an important polar aprotic solvent that dissolves both polar and nonpolar compounds and is miscible in a wide range of organic solvents as well as water. So, DMSO has been used to dissolve chemicals with poor water solubility in almost all in vitro test methods to detect skin sensitising potential of chemicals. However, DMSO does not change water solubility of chemicals. Therefore, once chemicals dissolved in DMSO are transferred to the culture medium to dilute DMSO to non-cytotoxic concentration, i.e., equal to or less than 0.5%, chemicals immediately precipitate if the concentration is over their solubility in water. Since it is difficult to mix chemicals in assay wells vigorously and to exactly determine whether precipitation is present or not in assay wells, the final concentration of chemicals in assay wells is unknown and is usually estimated based on the assumption that chemicals dissolved in DMSO are completely solubilized in the culture medium. In our previous publication (Kimura et al., 2015), we reported that the mIL-8 Luc could improve the sensitivity and the accuracy compared with that using DMSO as a solvent. So, in this study, we further increased the number of test chemicals and confirmed that the mIL-8 Luc improved the sensitivity and accuracy of the oIL-8 Luc, which indicated that DMSO to dissolve poorly water-soluble chemicals is not necessary to stimulate THP-G8 cells and possibly dendritic cells or monocytes. When the mIL-8 Luc was approved as the test guideline by the OECD, the criteria were modified to further decrease the possibility that chemicals are judged as negative by its poor water solubility. Consequently, the tgIL-8 Luc increased sensitivity and accuracy but decreased specificity. Now it is well known that a single assay would be sufficient to adequately assess sensitisation potential because of the complexity of the sensitisation process and that a more realistic approach involves the use of integrated approaches for testing and assessment (IATA) (reviewed by Roberts et al. (Roberts and Patlewicz, 2018)). Therefore, we combined the tgIL-8 Luc with DPRA because they focus on different key events of the skin sensitisation AOP and are different in the methods to evaluate chemicals. The integrated approach significantly improved its specificity and decreased the number of chemicals that are judged as “should not be considered” or included in the exclusion criteria. It is possible to combine the tgIL-8 Luc with other OECD test guidelines for in vitro skin sensitisation assays, such as h-CLAT, U-SENSTM, or KeratinoSensTM. Both h-CLAT and U-SENSTM target the third key event like the gtIL-8 Luc (OECD, 2018), while KeratinoSensTM evaluates the second key event (OECD, 2015a). These assays show different performances and limitations, although the OECD admits that these assays can contribute to the identification of skin sensitisation hazard. Since KeratinoSensTM targets the second key event that the tgIL-8 Luc does not evaluate, the combination with KeratinoSensTM or with DPRA and KeratinoSensTM. Now we are considering the optimum criteria to combine the data obtained by different assays. Finally, some of the physicochemical properties of chemicals that modulate their penetration into the viable layers of the epidermis have been fairly well characterized, including hydrophobicity (as measured by the logKo/w), the presence of charged groups, aqueous solubility, and molecular shape and size. All of these properties can be measured and/or calculated for a substance of defined chemical structure. For example, chemicals with a low molecular weight (< 500 g/mol) and logKo/w >1 are very likely to penetrate the lipid-rich stratum corneum. However, the value of being able to make predictions regarding the skin penetration of chemicals only becomes clear when combined with an understanding of what the chemical might do once in the viable epidermal layers and thus in contact with Langerhans cells (reviewed in Pease et al., (Smith Pease et al., 2003)). Before our current study, most of the studies examining the sensitising potential of chemicals dissolve them in culture medium supported by DMSO. So, it is not considered enough how chemicals with poor water solubility can be dissolved in the interstitial fluid in vivo. This study clearly demonstrated the possibility using the synthetic culture medium X-VIVOTM 15 that the interstitial fluid dissolves most known sensitizers partially, but to the concentration enough for stimulating Langerhans cells or DCs. In conclusion, our results demonstrate that the tgIL-8 Luc is a unique in vitro test method that can detect sensitizers in the purely aqueous phase. The tgIL-8 Luc provides data that cannot be obtained using any other test method and is thus suitable for use in integrated approaches. This work was supported in part by the New Energy and Industrial Development Organization (NEDO), by a Grant-in-Aid for Challenging Exploratory Research of Japan Society for the Promotion of Science (KAKENHI grant number 26670473), by Health Labor Sciences Research in Japan, by the Ministry of Economy, Science and Industry in Japan, and by the Japanese Society for Alternatives to Animal Experiments. Adler, S., Basketter, D., Creton, S., Pelkonen, O., van Benthem, J., et al. (2011): Alternative (non-animal) methods for cosmetics testing: current status and future prospects-2010. Arch. Toxicol., 85, 367-485. Gerberick, G.F., Ryan, C.A., Kern, P.S., Schlatter, H., Dearman, R.J., Kimber, I., Patlewicz, G.Y. and Basketter, D.A. (2005): Compilation of historical local lymph node data for evaluation of skin sensitization alternative methods. Dermatitis, 16, 157-202. Kimura, Y., Fujimura, C., Ito, Y., Takahashi, T., Nakajima, Y., Ohmiya, Y. and Aiba, S. (2015): Optimization of the IL-8 Luc assay as an in vitro test for skin sensitization. Toxicol. In Vitro, 29, 1816-1830. Kimura, Y., Fujimura, C., Ito, Y., Takahashi, T., Terui, H. and Aiba, S. (2018): Profiling the immunotoxicity of chemicals based on in vitro evaluation by a combination of the Multi-ImmunoTox assay and the IL-8 Luc assay. Arch. Toxicol., 92, 2043-2054. Nakajima, Y., Kimura, T., Sugata, K., Enomoto, T., Asakawa, A., Kubota, H., Ikeda, M. and Ohmiya, Y. (2005): Multicolor luciferase assay system: one-step monitoring of multiple gene expressions with a single substrate. Biotechniques, 38, 891-894. Natsch, A., Ryan, C.A., Foertsch, L., Emter, R., Jaworska, J., Gerberick, F. and Kern, P. (2013): A dataset on 145 chemicals tested in alternative assays for skin sensitization undergoing prevalidation. J. Appl. Toxicol., 33, 1337-1352. Noguchi, T., Ikeda, M., Ohmiya, Y. and Nakajima, Y. (2008): Simultaneous monitoring of independent gene expression patterns in two types of cocultured fibroblasts with different color-emitting luciferases. BMC Biotechnol., 8, 40. OECD (2012): The Adverse Outcome Pathway for Skin Sensitisation Initiated by Covalent Binding to Proteins, Part 1: Scientific Evidence. OECD Environment, Health and Safety Publications, Series on Testing and Assessment No. 168. OECD. (2015a): OECD Guideline for the Testing of Chemicals No. 442D: In Vitro Skin Sensitisation: ARE-Nrf2 Luciferase Test Method. Paris, France: Organisation for Economic Cooperation and Development. Available at: http://www.oecd.org/env/testguidelines. OECD. (2015b): OECD Guideline for the Testing of Chemicals No. 442C: In Chemico Skin Sensitisation: Direct Peptide Reactivity Assay (DPRA). Paris, France: Organisation for Economic Cooperation and Development. Available at: http://www.oecd.org/env/testguidelines. OECD (2018): OECD Test Gudeline for the Testing of Chemicals No.442E: In vitro skin sensitisation assays addressing the key event on activation of dendritic cells on the adverse outcome pathway for skin sensitisation. https://doi.org/10.1787/9789264264359-en. Reisinger, K., Hoffmann, S., Alépée, N., Ashikaga, T., Barroso, J., Elcombe, C., Gellatly, N., Galbiati, V., Gibbs, S., Groux, H., Hibatallah, J., Keller, D., Kern, P., Klaric, M., Kolle, S., Kuehnl, J., Lambrechts, N., Lindstedt, M., Millet, M., Martinozzi-Teissier, S., Natsch, A., Petersohn, D., Pike, I., Sakaguchi, H., Schepky, A., Tailhardat, M., Templier, M., van Vliet, E. and Maxwell, G. (2015): Systematic evaluation of non-animal test methods for skin sensitisation safety assessment. Toxicol. In Vitro, 29, 259-270. Roberts, D.W. and Patlewicz, G. (2018): Non-animal assessment of skin sensitization hazard: is an integrated testing strategy needed, and if so what should be integrated? J. Appl. Toxicol., 38, 41-50. Smith Pease, C.K., Basketter, D.A. and Patlewicz, G.Y. (2003): Contact allergy: the role of skin chemistry and metabolism. Clin. Exp. Dermatol., 28, 177-183. Takahashi, T., Kimura, Y., Saito, R., Nakajima, Y., Ohmiya, Y., Yamasaki, K. and Aiba, S. (2011): An in vitro test to screen skin sensitizers using a stable THP-1-derived IL-8 reporter cell line, THP-G8. Toxicol. Sci., 124, 359-369.